'Top 10 Bowling Exxxcuses' White Cotton Towel. 16" x 25"
1. The pro shop guy drilled my ball wrong. 2. The lane man doesn't like me. 3. Not enough oil on the lanes. 4. Automatic scorers must be figuring my scores wrong. 5. I drank too much beer. 6. Too much wax on the lanes. 7. I didn't drink enough beer. 8. The blonde bending over on next lane distracted me. 9. D@#% 10 pin don't fall. 10. My ball hooks too much. 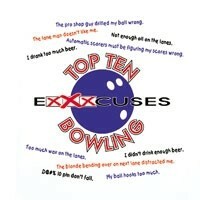 Due to the time it takes to produce the Top 10 Excuses About Bowling Towel ball it will ship in immediately. We cannot ship this ball outside the United States.